Blue House Inspections provide a full range of inspection services to property owners and the insurance industry. Using latest technology we can provide detailed video and photographic surveys to identify damage and determine the cause. Our aerial roof surveys are carried out by a fully CAA qualified drone pilot using state of the art equipment. The video is filmed in 4K and as such the quality of the photography is exceptional. Surveys can usually be arranged within a few days and the results sent to you electronically, normally within 24 hours. Not only do drones provide financial benefits, under many circumstances they provide greater flexibility in accessing difficult to reach places. Drones also have the potential to drastically reduce the amount of time taken to undertake a survey, or fast access in cases where emergency inspection is required. Utilising a drone can also offer safety benefits over those associated with personnel working at heights, utilising ladders, scaffolding or platforms. We can also provide detailed estimates for any remedial works that may be required. 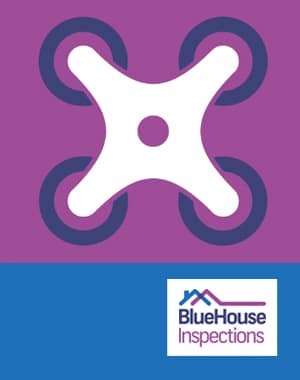 For further information please contact Blue House Inspections.